My husband generally refuses to believe that a meal without meat can actually be a meal, unless we’re talking about breakfast…until now. Comfort food came in the form of pot roast the just yesterday—but now it comes in a vegetarian and delicious kind of way. Moral? Comfort food on a cold night can mean different things to different people, but I dare you, I simply dare you, not to try a dish of delicious risotto on a November night. A few years back, when I was living in Richmond, my darling friend Leigh Ann and I supped at a quaint and yummy spot called Millie’s. 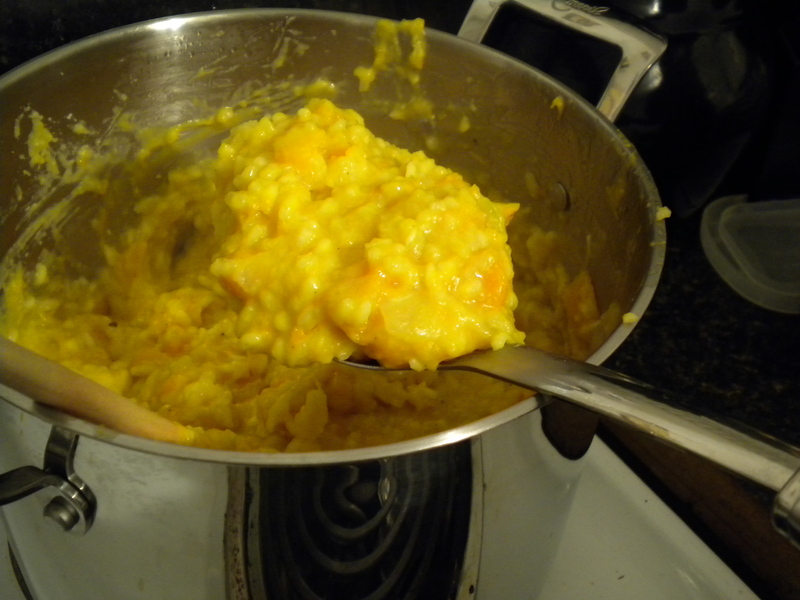 That was my first encounter with the vegetable known as butternut squash, and my first encounter with risotto. And what a sweet meeting it was! I have dreamt of that risotto since then. And I have hunted for recipes that might be as good. And I believe I have finally found the one…. ….actually, I have no recollection of how this one wound up in my books, but I have tampered with it enough so that I would call it my own. 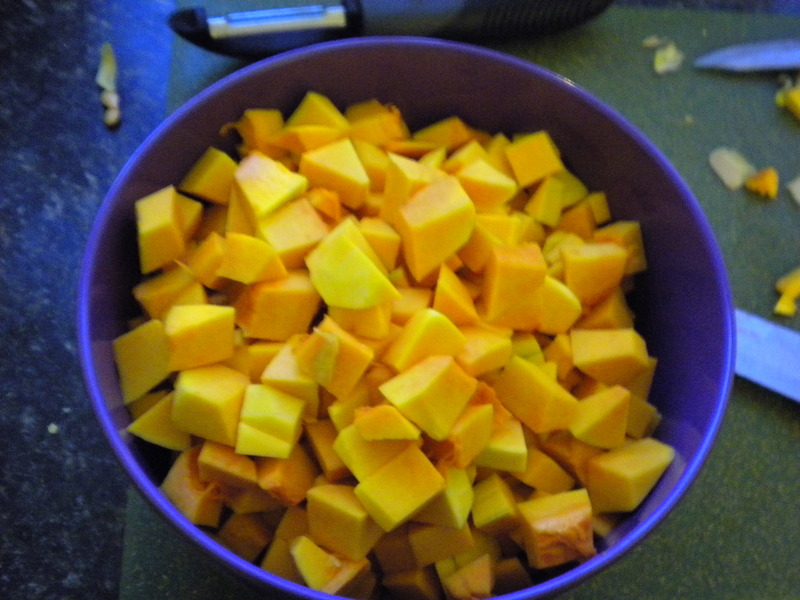 NOTE–you may go ahead and roast up the butternut squash before, if you are so inclined and desire that flavor, but the squash will cook up perfectly as directed. NOTE–if you must have meat, might I suggest crisping up some bacon to crumble upon each serving? The salty, crunchiness of bacon will be a nice contrast to the creaminess of the risotto. NOTE–you, of course, are free to do what you will with this recipe. I think a good swap for the Parmesan would be goat cheese. Now that I’m thinking about it, I am so trying that next time! FINAL NOTE: this can be a hearty and filling main dish, or a great side to a meat dish–my hubs Farley loves it as a main now! yeah! and we’re thinking about making this again next week to go with some short ribs….yay or nay? Let me know! 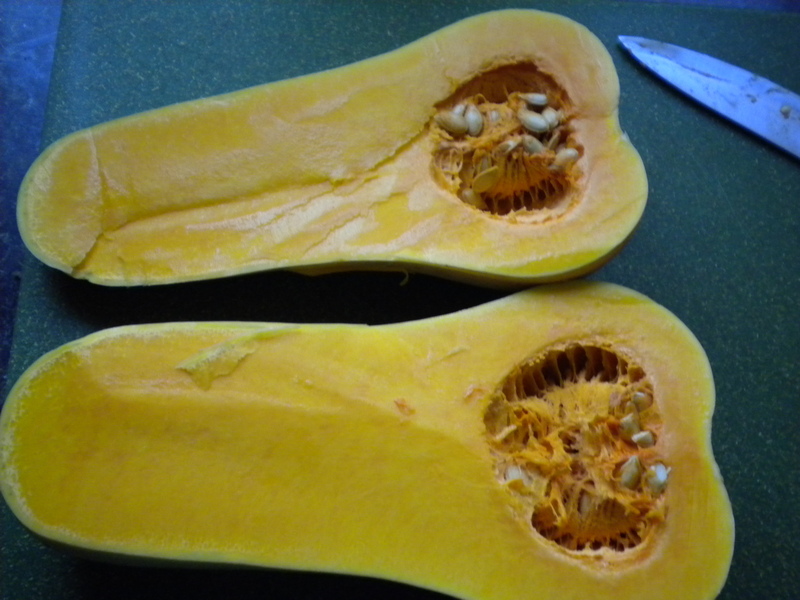 1–Before you do anything else, peel, seed, and chop up a 3 lb. butternut squash into a small dice, about 1/4 inch. This is the largest prep you need to do. While you’re at it, chop up 2 onions (2 cups) and thinly slice 4 cloves of garlic. 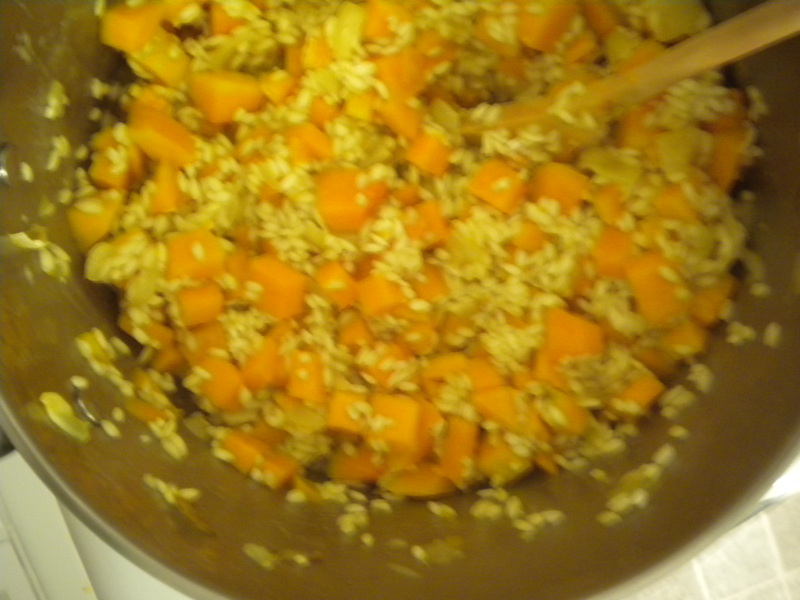 3–Add in the squash and 2 3/4 cups arborio rice and stir for 2-3 minutes. 5–Now comes the tedious-but-well-worth-it segment of our post…the stock adding. In 1/2 cup increments, add chicken stock and stir until it is absorbed. How will you know if it is absorbed or merely just getting creamier? Easy! Lift up your risotto and check the bottom of the pan. When there isn’t anymore liquid there, and it looks like your risotto is lightly covered in sauce (versus swimming amid sauce), that’s when you go ahead and add another 1/2 cupful of stock. 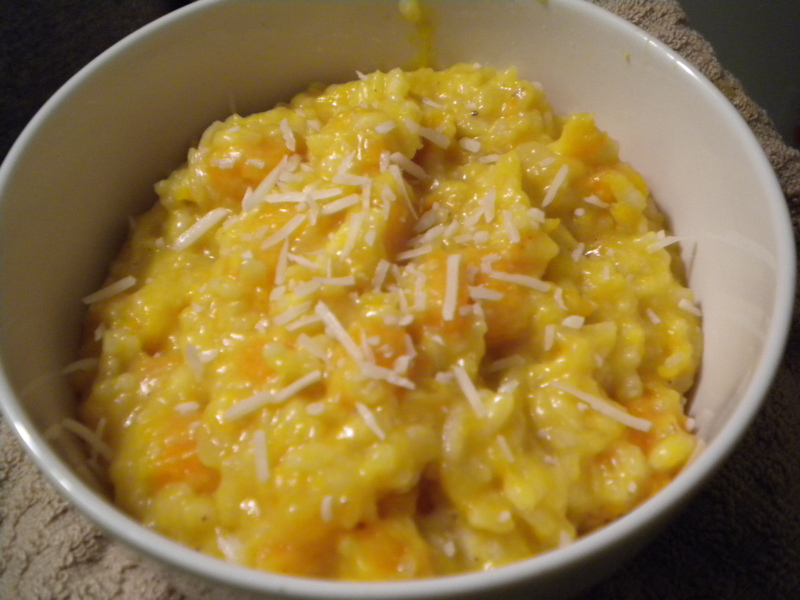 6–When your rice and squash are creamy and have a little bit of texture to them, you are finished…..almost! 7—Softly stir in 2 cups cheese (freshly grated Parmesan or Asiago are great for flavor) (but you could also use a mix of regular grating cheese –which for me is a Parmesan and Romano blen– and shredded Parmesan, since that’s what I had, or you could try the goat cheese suggestion above! ), 1/2 tsp. lemon juice, 1/4 tsp. nutmeg, and salt and pepper to taste. Like I said, my husband loved it last night and loved it as a main dish, and he is the carnivore of our marriage. Funnily, I prefer it as a side when eaten day-of….but as I am devouring a healthy-sized bowl of this here whilst writing, I am enjoying it even more the second time around. If you wanted to use something vegan instead of the chicken stock, you could use a low-sodium vegetable broth or a bouillon cube such as Edward and Sons’ Not Chick’n which I have found at Kroger. Yes, you could absolutely use the vegetable broth instead of chicken stock if you wanted to be more veggie-conscious in this dish; thanks for the reminder, Jeannette! Let me know if you try this out!! 1. 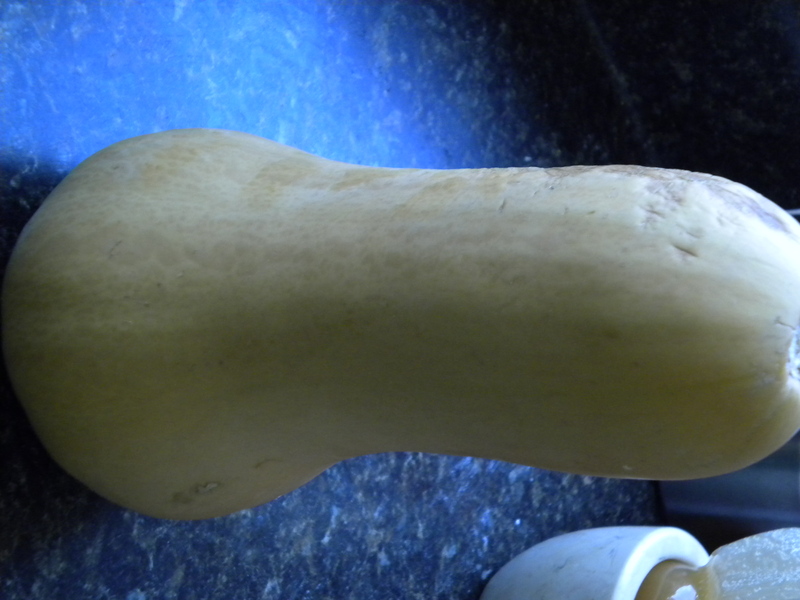 How long will a butternut squash keep? I’ve got one on my counter. 2. What is arborio rice? 2–Arborio rice is a short-grain white rice, an Italian rice! It gets creamy and slightly chewy and firm delicious when it’s cooked. It is the traditional form of rice used for “risotto.” I bought mine at Walmart, since Food Lion didn’t carry it. I don’t love shopping at Walmart, but they did carry the right product! Previous Previous post: perfect man food.